Three crew members from the International Space Station are due to return to Earth on Wednesday morning after 188 days in space, a spokesperson for Russia’s Mission Control Center said Tuesday. “Russian cosmonaut Mikhail Tyurin, JAXA astronaut Koichi Wakata and US astronaut Rick Mastacchio will come back aboard a re-entry capsule of the manned Soyuz TMA-11M spaceship,” the spokesperson was quoted by Russian state news agency Ria Novosti. The Soyuz spacecraft will undock from the ISS early on Wednesday, at 2:35 a.m. Moscow time, before reentering the atmosphere at 5:36 a.m., with the parachute deploying eight minutes later. The capsule is expected to touch down 148 km southeast of Kazakhstan’s Jezkazgan. The Soyuz TMA-11M spacecraft carrying a three-man crew and a symbolic torch for the 2014 Sochi Winter Olympic Games docked with the International Space Station on November 7, 2013. 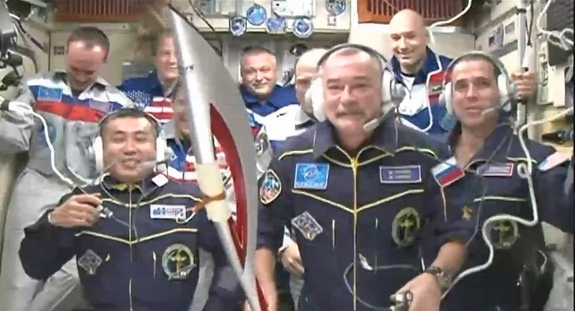 The Rossiya 24 TV channel showed the smiling nine-member crew passing around the unlit Olympic torch in a live broadcast from the ISS.